📲 Call Or Text 480.259.1735 Today For Your Free, No Obligation, Instant Quote! 😃 It's our goal to offer a simple, safe, fast, affordable, and stress-free service every time we are booked for a job! 💳 We accept Cash, Check, Credit, Debit, Apple Pay, Google Pay, and Samsung Pay! 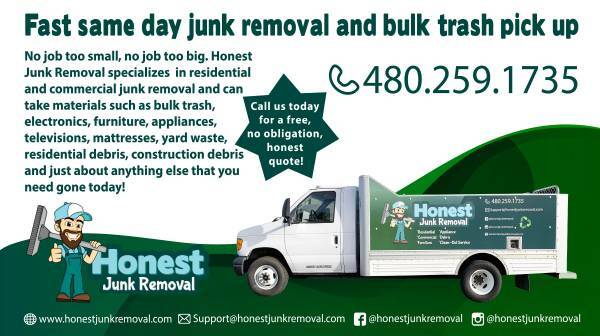 👍🏻 We are proud to be one of the most affordable junk removal comapanies in the valley! 🚛 We can pick up as little as 1 item or we can fill up the 15 foot truck! ♻️ We recycle and donate whenever possible. It’s important to us to keep our environmental footprint to a minimum, so we aim to keep as many items out of the landfill as we can! Call Or Text 480.259.1735 Today For Your Free, No Obligation Quote! *Just About Anything Else You Need Gone Today!